Free Google Home with Broadband Packages at BT Broadband Get yourself both an excellent reward and an amazing broadband package with BT Broadband. Superfast Fibre Unlimited Student Deal from £35 pm at BT Broadband Here's a great deal to shout about, get superfast with BT Broadband! £30 Reward Plus Free Google Home with Superfast Fibre 2 Orders at BT Broadband If you're looking to switch your broadband then you have come to the right place! Order from BT Broadband to get a £30 reward card and free Google Home. 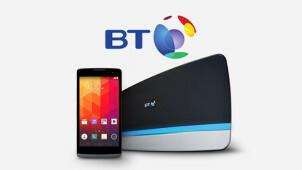 First Month Free with Homemover Orders at BT Broadband First Time Customers Offer. Free Google Home with Entertainment + Superfast Fibre Orders at BT Broadband If you love the entertainment channels then this is the deal for you! Order today and get a free gift! Free Google Hub with Max 4K + Superfast Fibre 2 Plus Orders at BT Broadband Get everything you'll ever need from a home broadband provider with the Max package from BT Broadband. Free Google Home with Superfast Fibre Packages at BT Broadband With Superfast Fibre, not only can you enjoy great streaming speeds but a free Google Home with your purchase! Free Google Home with Starter + Sport, Superfast Fibre Orders at BT Broadband If you don't like missing a minute of sports coverage then this BT Broadband package is for you! Order today and get an amazing reward card. BT provides the nation with internet connections, TV packages, mobile services and the latest in innovative technology. BT Broadband is available across the UK, as well as in other countries around the world. With the option to go fibre optic too, now that switch has never been easier. Connections are reliable, speeds are fast and the extras really can make a difference to the way we communicate and enjoy entertainment. We can't hide that we are fans of the BT Sports package. With more games showing than ever before, this is where live 42 Premier Leagues and more will be live before your very eyes and all for less when you use a BT Broadband discount code from us! BT Sport is so fast to set up, and you can get exclusive content, on the go. For the Rugby, Football, Cricket fan and more - you will be echoing our words once you discover this package. BT Broadband means browsing and downloading is always super speedy and seriously satisfying. We don't want restrictions, and with BT, you can set up whole home wi-fi so that every member of the family can enjoy doing the things they love, in whichever room they please! Now you won't be a prisoner to the room with the set-top box and be joining millions of customers who are enjoying the freedom of BT every day. The BT Smart Hub is full of impressive features that can outshine other UK broadband providers - find out more here and discover it for yourself. How do I use my BT Broadband voucher? You will need to set up your BT order with your details to complete the transaction. Sign up to the BT email newsletter and you'll receive insightful information on the best shows, new release films and sport straight to your inbox. How can I get a BT Sport bundle for free? The BT Sport pack is free for BT TV customers, and there are many ways to get a BT Sport pack fuss-free for both existing customers and non-BT customers. Check out the options here. How do I know if BT wi-fi will work for me? With 98% coverage across the UK, to check which broadband will be available for you in your area, take a look at the Broadband speed checker page and use your landline and postcode to find out the result. What is the price to make calls on BT Mobile? Tariffs can vary but see here to find out more such as the prices that will be charged should you use up your allowance. Get fast and reliable broadband, phone and digital TV all together with BT. The telecoms giant has an award-winning range of broadband packages available with inclusive extras too, check out a BT Broadband voucher today to experience some of the fastest broadband speeds in the UK. This is one to please the whole family, with unlimited broadband for internet hungry households, while business customers are sure to be impressed too with BT Business Broadband. You can have it all with BT. How do I use my BT Broadband discount code? The award-winning BT App is brilliant for customers to get access to their accounts on the go so as to manage bills, review products, set up extras and much more. It really is there on hand for if you need help, you can check the BT services in your area, check your own broadband speed and restart your hub all remotely - so it's easy to be a bit of an expert with this app. While you certainly need speedy broadband for your family home, there’s no doubt that an efficient and reliable service is indispensable for business. BT Business Broadband has been developed to cater to your company’s needs. Big or small, a BT Business Broadband voucher code will help you save on your digital makeover. Seamless, sleek and with the data that you need, with BT Business Broadband your business can go far beyond the ether!